short the hillslopes are above them. We could see a large logging operation at the top of a hill in the far distance. returning to the van we drove a little further before our professor decided to take us a quarter mile down a steep slope through a large debris flow to Knowles Creek below. The debris flow was actually pretty cool (just really hard to get through with a sore ankle after having rolled it in my first soccer game a few weeks ago with Watershed). It had displaced the flowing creek quite a ways and deposited a ton of material in it’s debris fan while also creating a virtual “resort” for a few beavers in the area who had shown a lot of recent activity of nibbling just before we got there. 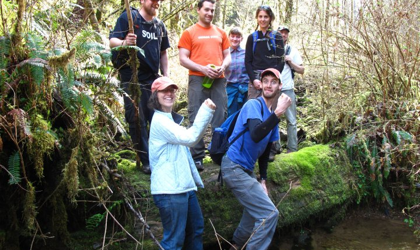 We were all happy to climb back out of the watershed though and return back to Corvallis.